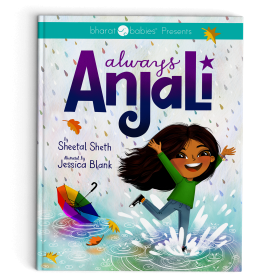 Meet Anjali, an inventive little girl with a great big heart. To some, she’s a little sassy, but to most, she’s clearly clever with much on her mind. But mostly, she’s just like everyone else. Except that she’s exceptional at the monkey bars. Better than the boys even. Plus, she doesn’t yet know that the things you are made fun of for when you are a kid, are exactly what will make you fly when you’re all grown up. Details on book signings and tour dates here. When Anjali finally gets the bike of her dreams on her birthday, she and her two best friends are excited to get matching license plates with their names on it. But Anjali cant find her name. Theres Amy, Betsy, Chris, and many more, but no Anjali. To make matters worse, she gets bullied for her different name, and is so upset she demands to change it. When her parents refuse and she is forced to take matters into her own hands, she winds up learning to celebrate who she is and carry her name with pride. A timeless story about appreciating what makes us special and honoring our differences.